Anywhere, Anytime Art: Illustration : An artist's guide to illustration on the go! With the approachable instruction andcontemporary approach to drawing featured in Anywhere, Anytime Art: Illustration, aspiring creatives of all backgrounds can learn how to make illustrative art on the go using pencil, pen, colored pencil, and more. Learn how to make art inspired by your immediate surroundings, wherever you arewhether traveling abroad or exploring at home. Use your art and creativity as a means to document your experiences, capture your travel memories, and dream of new adventures. After an overview of the suggested tools and materials, explore essential drawing techniques, such as mastering line art and gesture drawing, making quick on-location sketches, and working with color media to complement illustrations. Helpful tips include information for packing and traveling with art supplies, drawing in the open air, and working from photographs. Finally, easy-to-follow and customizable step-by-step projects show you how to creatively express yourself by combining color, pattern, texture, typography, and cultural experience with a variety of projects. 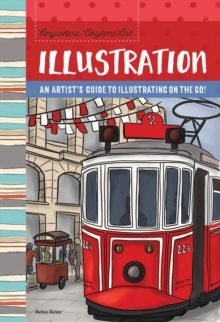 Packed with a plethora of fun and creative exercises, Anywhere, Anytime Art: Illustration is the perfect portable resource for creative types on the go.